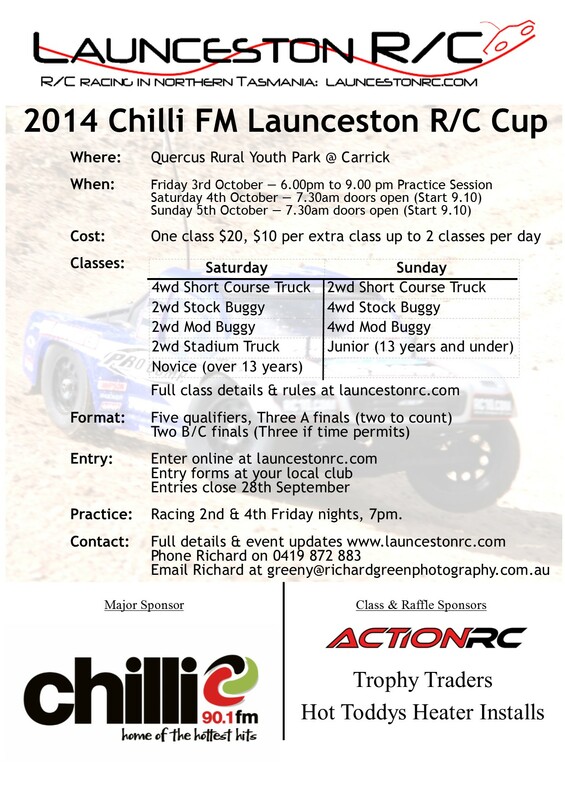 Yes, that’s right, the countdown is on to the 2014 Chilli FM Launceston Cup! There is little over a month to go until the big event, and already we have 80 entries for this years event. Yes, we are looking well on track to beat our previous record of 101 entries for the premiere indoor RC race in Tasmania, an unofficial Indoor State Championship if you like. So what is happening at this year’s event? well let me give you the rundown! Yes, there will be food, as well as the legendary Launceston RC canteen with chips, cold drinks and sweets, we have the amazing crew from Burger Junkie selling burgers for lunch each day, and the guys and gals from Bump “n”Grind serving up coffee from 8am each day and even coming out for the practice night. They will also be serving hot pies and sausage rolls. The rules for this event are our normal ones with AARCMCC regulations applicable in a number of areas. We want the event to be heavy on fun with minimal scrutineering, but we will have people checking a number of details before and after races. If you have concerns about a vehicle or are unsure about a rule or regulation, come and see the Race Director or one of the members of the Committee. Remember that you do have to marshal after your race, any car repairs can wait until after that. If you are not able to, you need to find somebody to do it for you. Entry is up the ram, and down the stairs on the drivers stand as well with cars being placed on the tables before you head out to marshal. There will be a Concours (or concours d’elegance to give it’s full name) on Saturday and Sunday with a trophy for the winner each day, so clean up your car and put your best body shell forward.